GoodAIM is a free program designed for the AIM user that adds fun and exciting features to AOL Instant Messenger. GoodAIM has been discontinued, and no support is offered anymore. * Send IMs while away! * Real time IM logging in full HTML! GoodAIM has also been tested and found to work with other Windows AIM clients, such as Trillian, and the Windows version of GAIM. 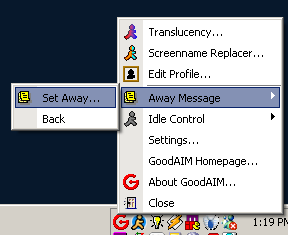 Theoretically, GoodAIM should work with any Windows AIM client that supports a SOCKS4 proxy. You can even use GoodAIM with any other AIM add-ons or enhancements that you may own. The only requirement is that you must still be able to route AIM through a SOCKS4 proxy. System Mechanic Professional 7 is out ! Possible launch of a Google IM ? Samsung and Google Cooperation > Google Phone !